By way of apology for The Legal Genealogists‘s delay in letting readers know about the Virtual Fair from the National Archives earlier this week, here’s a guide to NARA’s virtual educational materials available free online. I mean, we don’t tend to think of an institute like the National Archives of the United States as being a regular contributor to YouTube… but we should. 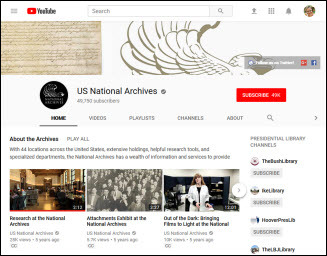 NARA’s YouTube channel — here — offers a virtual cornucopia of information about the National Archives, about records there, about researching in person at its facilities, and about genealogical research in general. It should be right up there on the must-see lists of any genealogist. So… what kind of information can you find? • the 2014 Virtual Fair Day 1, https://www.youtube.com/watch?v=L4o3_Ox_cUY&list=PLC641EF0E3F8AFDF9&index=33“>Day 2, and Day 3. • Oh, the Stories They Tell: Chinese Exclusion Acts Case Files at the National Archives, presented by Susan Karren, Director, National Archives at Seattle. • African American Soldiers in the Great War, presented by Archives technician Matthew Margis. • Introduction to the Captured German Records at the National Archives, presented by Archivist Rachael Salyer. • Civil War Voices: Records from the National Archives and a Personal Collection, presented by Researcher John Emond. • Restoring the Brotherhood of Union: Confederate Pardon and Amnesty Records, 1865-1877, presented by Archives specialist John Deeben. • Using Pre-1850 Census to Find Family Relationships, presented by archivist Jean Nudd. Starting to get a feel for the goodies that you might find here? And that’s just one playlist, out of more than 60 playlists created by NARA, with hundreds of videos both short and long. Spend some time with NARA’s YouTube channel. And oh… by the way… if you’d like a bit more guidance about research in federal records, my colleague Malissa Ruffner is presenting a free webinar in the series sponsored by the Board for Certification of Genealogists. On November 21, she’ll present Research in Federal Records: Some Assembly Required as part of the Legacy Family Tree webinar series. Register for this event and view BCG’s past Legacy webinars using BCG’s affiliate link at http://legacy.familytreewebinars.com/?aid=2619 (note: BCG receives a commission if you register by clicking our affiliate link, and we thank you for it! ).